The aim of this study was to assess the cost effectiveness of semaglutide versus dulaglutide, as an add-on to metformin monotherapy, for the treatment of type 2 diabetes (T2D), from a Canadian societal perspective. The Swedish Institute for Health Economics Cohort Model of T2D was used to assess the cost effectiveness of once-weekly semaglutide (0.5 or 1.0 mg) versus once-weekly dulaglutide (0.75 or 1.5 mg) over a 40-year time horizon. Using data from the SUSTAIN 7 trial, which demonstrated comparatively greater reductions in glycated hemoglobin (HbA1c), body mass index and systolic blood pressure with semaglutide, compared with dulaglutide, a deterministic base-case and scenario simulation were conducted. The robustness of the results was evaluated with probabilistic sensitivity analyses and 15 deterministic sensitivity analyses. The base-case analysis indicated that semaglutide is a dominant treatment option, compared with dulaglutide. Semaglutide was associated with lower total costs (Canadian dollars [CAN$]) versus dulaglutide for both low-dose (CAN$113,287 vs. CAN$113,690; cost-saving: CAN$403) and high-dose (CAN$112,983 vs. CAN$113,695; cost-saving: CAN$711) comparisons. Semaglutide resulted in increased quality-adjusted life-years (QALYs) and QALY gains, compared with dulaglutide, for both low-dose (11.10 vs. 11.07 QALYs; + 0.04 QALYs) and high-dose (11.12 vs. 11.07 QALYs; + 0.05 QALYs) comparisons. The probabilistic sensitivity analysis showed that for 66–73% of iterations, semaglutide was either dominant or was considered cost effective at a willingness-to-pay threshold of CAN$50,000. From a Canadian societal perspective, semaglutide may be a cost-effective treatment option versus dulaglutide in patients with T2D who are inadequately controlled on metformin monotherapy. Part of this work was previously presented at the 2017 American Association of Diabetes (ADA) 78th Scientific Sessions, Orlando, FL, USA, 22–26 June 2018. The abstract was published in the journal Diabetes (Johansen et al. ). The online version of this article ( https://doi.org/10.1007/s41669-019-0131-6) contains supplementary material, which is available to authorized users. This is the first application of the Swedish Institute for Health Economics Cohort Model of T2D, a validated and transparent model, in assessing the cost effectiveness of semaglutide versus dulaglutide from a Canadian societal perspective, incorporating both a simplified base-case and an alternative scenario analysis. Semaglutide is demonstrably a cost-effective treatment option versus dulaglutide in patients with T2D inadequately controlled on metformin monotherapy, providing evidence to support decision makers in the Canadian healthcare system in recommending semaglutide as a glucagon-like peptide-1 receptor agonist for reimbursement. In Canada, the number of people with diabetes was 2.6 million in 2017 and is expected to rise to 3.2 million in 2045 . Type 2 diabetes (T2D) accounts for over 90% of diabetes cases . The disease is chronic, progressive, and complex, and is associated with numerous complications, such as cardiovascular (CV) disease, which is the most common cause of death for people with diabetes . In 2010, the predicted economic burden of both direct and indirect costs of T2D in Canada was 12.2 billion Canadian dollars (CAN$) per annum , and this cost is projected to increase to CAN$16.9 billion by 2020 . Diabetic complications and their management contribute significantly to the health and economic burden . Several new treatments for T2D have recently become available and, given the burden of the disease, it is important to assess and compare the value for money of these interventions. Economic modeling techniques have become recommended  and widely used tools that consider the long-term clinical outcomes and economic value of such new interventions, thereby aiding decision making in the selection of treatments for reimbursement. 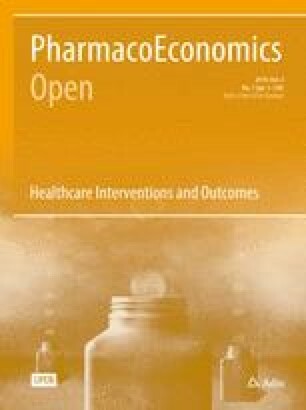 Cost-effectiveness analyses go beyond the efficacy results of clinical trials and individual drug costs, and reflect country-specific differences in local guidelines, healthcare systems and their willingness to pay, and costs of complications, among other factors, all of which may impact the evaluation of economic viability. Given the complex, multifactorial and chronic nature of T2D, designing an economic model that can effectively assess the impact of interventions is challenging . There are a range of long-term economic models for diabetes, including CORE [9, 10], Economic and Health Outcomes Model of Type 2 Diabetes Mellitus (ECHO-T2DM) [11, 12], United Kingdom Prospective Diabetes Study (UKPDS) Outcomes Models 1  and 2  and Cardiff [15, 16]. However, despite being used in health technology assessment (HTA) submissions around the world, the optimal design of these models is still under discussion by expert groups , and being considered by the Canadian Agency for Drugs and Technology in Health (CADTH) . For the purpose of this analysis, we sought to use a model that was easy to use, open source, transparent, able to address uncertainty, and applicable to more than one compound as these qualities were deemed to be the most appropriate and desired by Canadian stakeholders. An existing economic model that met these criteria, developed by the Swedish Institute for Health Economics (IHE), is the IHE Cohort Model of T2D. This Microsoft® Excel-based model, with Visual Basic for Applications (VBA) coding, utilizes Markov health states. These aspects deliver the requirements of simplified and accessible use; verifiable methodology, assumptions and calculations; generation of probabilistic analyses to address uncertainty; and being applicable for any treatment for diabetes. This externally validated model  is expected to satisfactorily approximate the characteristics, treatment options and treatment patterns of patients with diabetes in clinical practice in Canada. From an economic perspective, the model addresses all relevant factors and is an appropriate choice for assessing the cost effectiveness of interventions for T2D from a Canadian societal perspective. For these reasons, the IHE Cohort Model of T2D was selected for the current study to assess the cost effectiveness of once-weekly semaglutide (Novo Nordisk, Denmark) versus once-weekly dulaglutide (Eli Lilly and Company, USA), two glucagon-like peptide-1 receptor agonists (GLP-1RAs) recently approved in Canada (2018 and 2016, respectively) for the treatment of T2D [19, 20]. In the global phase III clinical trial program SUSTAIN (Semaglutide Unabated Sustainability in Treatment of Type 2 Diabetes), semaglutide was compared with a range of other treatments for T2D [21, 22, 23, 24, 25, 26, 27]. The SUSTAIN 7 trial compared once-weekly semaglutide with once-weekly dulaglutide, as an add-on to metformin . After 40 weeks of treatment, reductions from baseline in glycated hemoglobin (HbA1c) and body weight were superior with semaglutide for both the high-dose comparison (1.0 mg semaglutide vs. 1.5 mg dulaglutide) and low-dose comparison (0.5 mg semaglutide vs. 0.75 mg dulaglutide) [p < 0.0001] . Furthermore, a significantly greater proportion of subjects with T2D achieved clinically meaningful glycemic targets (HbA1c < 7.0%; p < 0.0021 for the high-dose comparison, p < 0.0001 for the low-dose comparison) and weight-loss responses (≥ 5% weight loss; p < 0.0001 for both dose comparisons) with semaglutide compared with dulaglutide, while exhibiting similar safety profiles . The aim of this study was to assess the cost effectiveness of once-weekly semaglutide versus once-weekly dulaglutide, as an add-on to metformin, for the treatment of T2D, from a Canadian societal perspective. The IHE Cohort Model of T2D was constructed in Microsoft® Excel 2013, with the aid of built-in VBA, and uses Markov health states to capture important micro- and macrovascular complications and premature mortality associated with T2D. A simplified overview is presented in Fig. 1. The model compares two treatment strategies, which are defined by the user in terms of treatments used and the associated expected effect on glycemic control, weight change and risk of hypoglycemia. The cycle length is 1 year, with a maximum time horizon of 40 years. Uncertainty in the model parameters (second-order uncertainty) is captured by means of probabilistic sensitivity analysis (PSA). Time-varying transition probabilities are calculated on the basis of characteristics of the cohort (e.g. diabetes duration, demographics, biomarkers) and user-defined selection of risk equations. 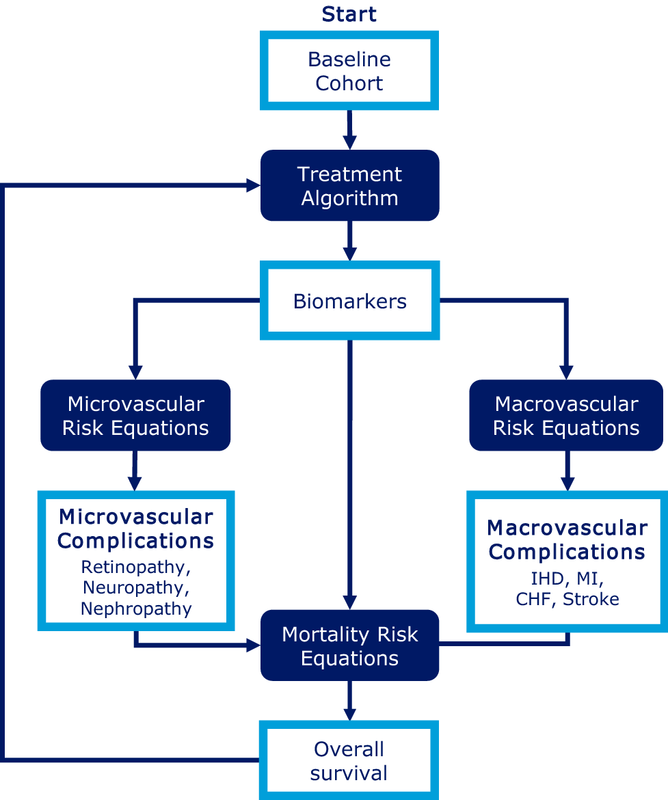 Mortality risk equations are sourced from UKPDS 68  or UKPDS 82 ; macrovascular risk equations are sourced from the Swedish National Diabetes Register (NDR) , UKPDS 68  or UKPDS 82 ; and microvascular risk equations are sourced from other diabetes models [29, 30, 31]. Further details on the model structure are presented in Online Resource 1, and in the model validation study . Previously, the model has been applied to assess the cost effectiveness of several new antihyperglycemic treatment alternatives [32, 33, 34, 35] and has been used for reimbursement decisions by the Dental and Pharmaceutical Benefits Agency (TLV) in Sweden [36, 37]. The National Board of Health and Welfare in Sweden has also used the model in the development of the 2015 National Guidelines for Diabetes Care . A deterministic base-case simulation (using a 40-year time horizon) and a PSA using 1000 iterations were conducted. In line with modeling conducted in the CADTH 2017 report , the UKPDS 82 risk equations for macrovascular complications and mortality were chosen . Furthermore, these equations also include separate risk equations for secondary events for some complications. Additional key assumptions are presented in Table 1. In addition, a scenario analysis, in which modeled treatment patterns were changed to reflect alternative, clinically relevant circumstances, and 15 deterministic sensitivity analyses (DSAs) were conducted. To ensure transparency and reproducibility, the Diabetes Modeling Input Checklist (Eighth Mount Hood Challenge) and the Consolidated Health Economic Evaluation Reporting Standards (CHEERS) checklist were completed during the set-up and reporting of this study [40, 41] and are included in the electronic supplementary material (Online Resources 11 and 12). In the simulation, patients initiate treatment with either semaglutide (0.5 or 1.0 mg) or dulaglutide (0.75 or 1.5 mg). For a 3-year period, GLP-1RA treatment is assumed to be maintained, after which semaglutide and dulaglutide are discontinued and basal insulin initiated. Although no data were available specifically showing the benefits of GLP-1RAs up to 3 years, a quantitative investigation into physician treatment practices in five major European countries showed that the mean treatment duration for GLP-1RAs was 29.35 months . For the modeling analysis, this was rounded up to 3 years (36 months) because treatment switching can only occur at the end of the model’s annual cycles. The SUSTAIN 6 trial provides additional support for long-term benefits of GLP-1RAs; in this trial, semaglutide provided significant and sustained improvements in clinical parameters, especially body weight, over 104 weeks . The 3-year timeframe is also consistent with previously published cost-effectiveness studies [43, 44, 45]. The following assumptions were made for the simulation period: HbA1c (%) and body mass index (BMI) remain at the level observed after the first-year treatment effect has been applied; systolic blood pressure (SBP) and lipid levels ‘drift’ upwards following application of the treatment effect; the efficacy of basal insulin treatment maintains HbA1c at 8.0%; and upon discontinuation of GLP-1RA treatment, BMI reverts to baseline values . These assumptions, in regard to treatment with basal insulin, were later tested in a scenario analysis. The scenario analysis simulates the impact of an alternative disease progression that more accurately represents the management of diabetes in clinical practice. Specifically, HbA1c is assumed to ‘drift’ upward at a rate of 0.14% per year according to data in the study by Kahn et al. , which has also been applied in other modeling studies [47, 48, 49]. When this drifting results in patients’ HbA1c levels reaching 8.0%, GLP-1RA treatment is discontinued and insulin treatment initiated. In contrast to the base-case, the scenario analysis models the effects of insulin treatment on HbA1c, BMI and hypoglycemia. Treatment effects were derived from the study by Willis et al. that estimated parsimonious prediction equations for changes in HbA1c and weight, as well as hypoglycemic events , and estimated using the CORE specification equation for insulin-naïve patients, while rates for non-severe and severe hypoglycemia were based on insulin-naïve patients with an average HbA1c of 7.5–8.0% (Online Resource 9). Insulin treatment results in HbA1c reductions, but once HbA1c levels again reach 8.0%, the assumption is the same as in the base-case analysis, in that HbA1c levels are fixed at 8.0% for the remainder of the simulation, i.e. for the remainder of the model’s time horizon. A PSA using 1000 iterations was also performed for this analysis. Fifteen DSAs were conducted to assess the robustness of the base-case result, encompassing changes in clinical parameters (DSA 1–3, 6–10, 15), time horizons (DSA 4–5), and cost parameters (DSA 11–14). Data on patient demographics and clinical characteristics were sourced from SUSTAIN 7 results (Table 2). Treatment effects on HbA1c, SBP, total cholesterol, low-density lipoprotein (LDL) cholesterol, high-density lipoprotein (HDL) cholesterol, triglycerides, BMI, estimated glomerular filtration rate (eGFR), and non-severe and severe hypoglycemic events for patients treated with semaglutide and dulaglutide were sourced from SUSTAIN 7 (Online Resource 2), where possible . Data on treatment effects from SUSTAIN 7 that had not previously been published were derived from supplementary post hoc analyses. Baseline data and patient characteristics for health-related quality of life (HRQoL) were estimated from the CODE-2 study, which used multivariate regression techniques and a data set of 4461 patients with T2D to attribute HRQoL decrements to specific individual patient characteristics, treatments and health complications . Decrements for each episode of micro- and macrovascular complications were subtracted from baseline values. Disutilities for HRQoL used in the CADTH 2017 report were applied wherever possible , and supplemented with data from cross-sectional studies (Online Resource 3). Canada-specific costs for micro- and macrovascular complications and hypoglycemic events were derived from the CADTH 2017 report wherever possible. Costs that were unavailable from this report were sourced from a US study that used direct data analysis and microcosting to estimate costs, converted to Canadian dollars and adjusted for inflation (Online Resources 4 and 5) [52, 53]. All costs are reported in 2017 Canadian dollars. The cost for both semaglutide and dulaglutide was CAN$195.06 for a package supplying 4 weeks of treatment, equivalent to CAN$6.97 per day or CAN$2544 per year. Annual costs of CAN$1259 were associated with basal insulin treatment, and comprised CAN$757 for neutral protamine Hagedorn (NPH) insulin, CAN$177 for needles and CAN$325 for test strips (Online Resource 6). Indirect costs (e.g. loss of work productivity) are an important consideration in cost-effectiveness analyses because they account for the wider societal impact of diseases and treatment interventions. Data on the association between specific diabetes complications and loss of productivity are scarce, and a conservative assumption was made that diabetes-related loss of productivity was mainly attributable to severe stages of micro- and macrovascular complications. Because of a lack of data suitable for economic modeling of productivity losses in Canada, assumptions were based on a Danish register study from 2013, in which an estimation of absences from work (days per year) associated with diabetes-related complications was determined from 34,882 individuals (age 18–70 years) with hospital-diagnosed diabetes . Data for productivity loss and employment-to-population ratio used to estimate indirect costs are shown in Online Resources 7 and 8. The simulated progression in risk factors over time for semaglutide and dulaglutide are shown in Fig. 2, comparing semaglutide 0.5 mg with dulaglutide 0.75 mg (Fig. 2a–c), and semaglutide 1.0 mg with dulaglutide 1.5 mg (Fig. 2d–f). The progression in HbA1c (Fig. 2a, d), SBP (Fig. 2b, e), and BMI (Fig. 2c, f) over time is in line with the findings for semaglutide compared with dulaglutide, as observed over 40 weeks in the SUSTAIN 7 trial . These results led to differences in modeled cost and health outcomes over time. Overall, while the daily acquisition cost of semaglutide and dulaglutide is identical, the total cost of treatment is predicted to be slightly higher with semaglutide versus dulaglutide for both the low-dose (CAN$25,501 vs. CAN$25,481) and high-dose (CAN$25,534 vs. CAN$25,476) comparisons, which may be related to the slightly higher simulated survival associated with semaglutide. For micro- and macrovascular complications, semaglutide was associated with lower cumulative incidences of retinopathy, nephropathy, myocardial infarction and stroke (Online Resource 10). Differences were smallest for neuropathy and no benefit was evident with semaglutide versus dulaglutide for peripheral vascular disease. Differences were greatest for CV events; semaglutide was associated with a relative risk reduction (RRR) of 3.10% and 2.70% for the occurrence of first stroke and second or subsequent stroke, respectively, for the high-dose comparison. However, these differences are effectively minimized as the base-case assumes a fixed 3-year treatment duration, after which differences in HbA1c and BMI are eliminated. As these are important risk factors for predicting micro- and macrovascular complications, the reductions in HbA1c and BMI achieved during this limited timeframe are likely to lead to even small increases in survival. The impact of these assumptions was tested in the scenario analysis described below. Semaglutide was associated with lower overall total costs for both the low-dose (CAN$113,287 vs. CAN$113,690) and high-dose (CAN$112,983 vs. CAN$113,695) comparisons, representing total cost savings with semaglutide of CAN$403 and CAN$711, respectively (Table 3). Furthermore, semaglutide generated quality-adjusted life-year (QALY) gains of 0.04 for the low-dose comparison and 0.05 for the high-dose comparison, i.e. semaglutide was dominant (Table 3). The PSA of the base-case is presented in Fig. 3, which shows the cost-effectiveness plane (CEP) for 1000 iterations in the PSA. With the majority (66–73%) of the iterations below the willingness-to-pay (WTP) threshold of CAN$50,000, semaglutide was considered to be cost effective. In the base-case PSA analysis for semaglutide 0.5 mg versus dulaglutide 0.75 mg, the mean incremental QALYs and costs were 0.06 and CAN$ − 1288, respectively, and, at a WTP threshold of CAN$50,000, 66% of the incremental cost-effectiveness ratios (ICERs) were cost effective (Fig. 3a). For semaglutide 1.0 mg versus dulaglutide 1.5 mg, the mean incremental QALYs and costs were 0.09 and CAN$ − 2191, respectively, and, at a WTP threshold of CAN$50,000, 73% of ICERs were cost effective (Fig. 3b). In the more clinically relevant scenario analysis, there was greater differentiation between semaglutide and dulaglutide in the progression of the risk factors HbA1c (Fig. 2g, j), SBP (Fig. 2h, k), and BMI (Fig. 2i, l) over time. Semaglutide was associated with higher total costs than dulaglutide for both dose comparisons, with total increased expenditure of CAN$1305 and CAN$1977, respectively (Table 4). Comparisons of semaglutide versus dulaglutide generated QALY gains of 0.35 for the low-dose comparison and 0.40 for the high-dose comparison, giving ICERs of CAN$5585 and CAN$3296, respectively, per QALY. The higher total cost of semaglutide is explained by the assumed drift in HbA1c, whereby patients were only switched to basal insulin once HbA1c levels had drifted up to the threshold of 8.0%. For both low- and high-dose comparisons, patients taking semaglutide experienced a greater initial drop in HbA1c at the beginning of the simulation, compared with dulaglutide. Consequently, patients in both the low- and high-dose semaglutide arms remained on GLP-1RA treatment for 3 years longer than those receiving dulaglutide treatment, before switching to the less costly insulin treatment. Figure 3 shows the CEP for 1000 iterations in the PSA for the scenario analysis; in the majority of iterations (98%), semaglutide was cost effective (i.e. below the WTP threshold of CAN$50,000). For semaglutide 0.5 mg versus dulaglutide 0.75 mg, the mean incremental QALY gains were 0.41, and the mean incremental costs were CAN$530; at a WTP threshold of CAN$50,000, 98% of the iterations were cost effective (Fig. 3c). 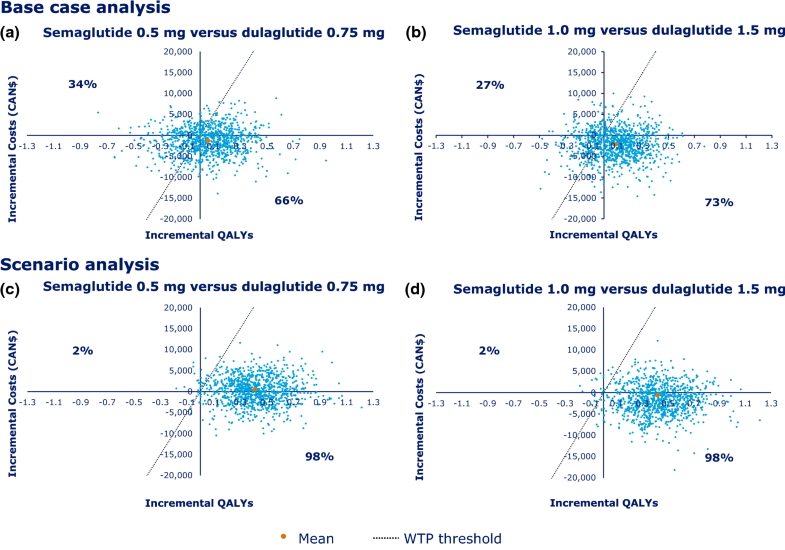 For semaglutide 1.0 mg versus dulaglutide 1.5 mg, the mean incremental QALY gains were 0.42 and the mean incremental costs were CAN$ − 613; at a WTP threshold of CAN$50,000, 98% of the iterations were cost effective (Fig. 3d). Findings from the DSAs support the results of the base-case. Semaglutide was dominant in nearly all DSAs, regardless of changes in clinical parameters, time horizons, or cost parameters. 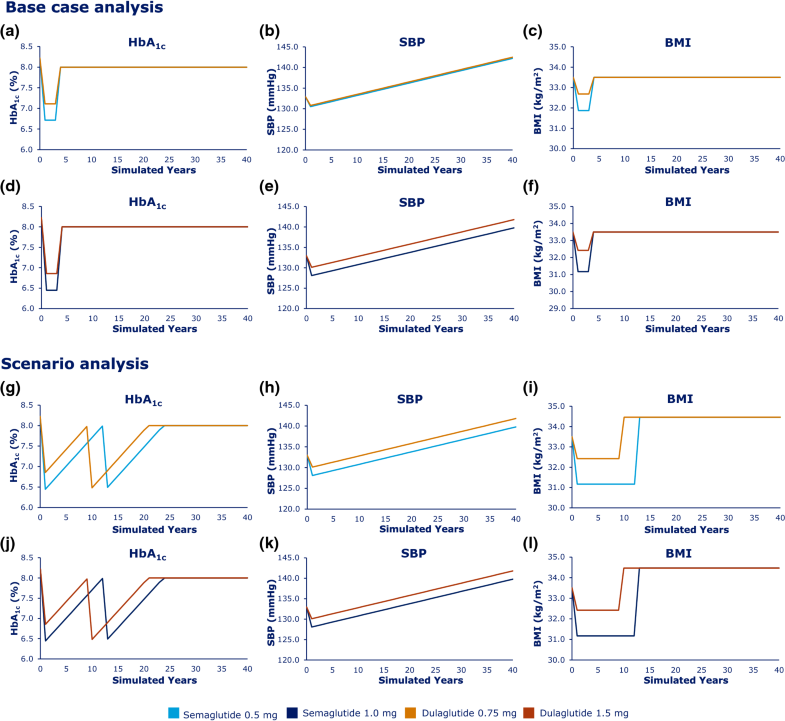 Details of the sensitivity analyses for low- and high-dose comparisons of semaglutide and dulaglutide are shown in Table 4. When changing clinical parameters, and even using the more extreme assumptions of DSA1 (change in HbA1c was the only difference in efficacy between treatments, with differences in all other effect parameters set to zero), semaglutide still dominated dulaglutide. While the remaining DSAs demonstrated QALY gains of 0.02–0.07, in DSA6, where treatment-related differences in BMI were maintained throughout the patient’s lifetime, QALY gains of 0.13 for the low-dose comparison and 0.16 for the high-dose comparison were observed, with costs decreased by CAN$533 and CAN$913, respectively. Alternatively, in DSA15, an assumption is made regarding an upwards drift in HbA1c (0.14% per year) following initial treatment effects until 8.0%, at which point GLP-1RA treatment is discontinued. However, in contrast to the scenario analysis, in which the effects of insulin on HbA1c and BMI are taken into consideration, the insulin treatment maintains HbA1c levels at 8.0%, as in the base-case. With no insulin treatment effects assumed, semaglutide was cost effective, compared with dulaglutide, for both the low-dose (QALY gains of 0.36; cost increase CAN$1561; ICER 4397) and high-dose (QALY gains of 0.38; cost increase CAN$905; ICER 2397) comparisons. As with the scenario analysis, the increase in total cost is related to patients having semaglutide treatment for longer, compared with dulaglutide, with associated costs offset by reduced complications (results not shown). QALYs increased due to a larger separation in HbA1c level and BMI over time between treatment arms and because patients taking dulaglutide started insulin therapy (which is associated with more hypoglycemic events) earlier than semaglutide. These results yielded a low ICER of CAN$1900 per QALY gained. When the time horizon was shortened to 20 (DSA4) or 10 years (DSA5), semaglutide dominated dulaglutide. However, as would be expected for the shorter timeframes, the QALY gains and total cost differences decreased. Semaglutide also dominated dulaglutide when the cost of complications or the costs of drugs were adjusted by 10%. This analysis from a Canadian perspective demonstrated that treatment with semaglutide results in reduced micro- and macrovascular complications and QALY gains, compared with dulaglutide treatment. Total costs were also lower with semaglutide than with dulaglutide, although the difference was modest. The reduced cumulative incidences of micro- and macrovascular complications observed at the end of the simulation, which are the result of the superior treatment effects associated with semaglutide, mean that patients’ life expectancy increases. Because the time spent on semaglutide and dulaglutide treatment was equivalent, with the exception of the scenario analysis and DSA15, the intervention costs should be comparable. However, it is likely that increased treatment costs for semaglutide are underpinned by the small survival difference favoring semaglutide during the first 3 years of the simulation. Micro- and macrovascular complications impose a significant cost burden to the Canadian economy, and treatments such as semaglutide that have the potential to reduce such complications may limit these costs (direct and indirect), in addition to reducing CV morbidity and mortality among patients . The outcomes from the base-case analysis, which allowed for a straightforward comparison of the treatments, resulted in QALY gains and lower total costs, so that semaglutide dominated dulaglutide. Although the reported gains might be considered marginal, the base-case does not permit marked separation in the risk factors, uses a short 3-year treatment duration, and assumes that changes in HbA1c and BMI progress in the same way, irrespective of the treatment arm. These factors effectively minimize any differences between treatment arms, and can be considered to be conservative assumptions, so that efficiencies in a real-life setting could be even greater. In contrast, while the more complex scenario analysis may better represent clinical practice, it has the disadvantage of introducing more uncertainty (e.g. through integration of the treatment effects of insulin). Nevertheless, additional QALY gains were observed for both the low-dose and high-dose comparisons in the scenario analysis (0.35 and 0.40 QALYs), compared with the base-case (0.04 and 0.05 QALYs). Since, at the start of the simulation, patients taking semaglutide experience a more robust HbA1c reduction, irrespective of dose comparison, they remain on therapy longer than patients treated with dulaglutide, before switching to insulin. Consequently, despite increased direct drug costs from living longer, there are also cost offsets. Not only is the spending on insulin lower in the semaglutide arm, because patients taking dulaglutide start insulin treatment earlier, but there are also lower costs over a longer time period due to reduced micro- and macrovascular complications. Indeed, the ICERs for semaglutide are favorable, generating ICERs of CAN$5585 (low-dose comparison) and CAN$3296 (high-dose comparison), respectively, per QALY gained. The majority of ICERs for semaglutide versus dulaglutide fell below the WTP threshold of CAN$50,000, indicating that semaglutide is likely to be cost effective in the Canadian setting. As with any modeling study, results should be interpreted with caution. One potential limitation is generalizing from international trial data to a Canadian population. However, as in this study, initial evaluations of cost effectiveness are frequently based on trial data for both patient characteristics and treatment effects, thus maintaining the high internal validity, with the effects of the drugs observed in the trial directly applicable to those patients participating in the trial. The estimation of the HRQoL decrements was based on a European population, which may also limit the applicability to the Canadian population. To the authors’ knowledge, there are no Canadian-specific HRQoL equations or any validation of the CODE-2 or UKPDS HRQoL equations, therefore values previously accepted by Canadian HTA authorities (including CADTH) were applied. Furthermore, two US-based sets of risk equations in patients with T2D—RECODe  and BRAVO —have been published, of which the BRAVO equations  could be of interest for cost-effectiveness modeling in a Canadian population, supplementing the UKPDS equations. However, as these sets of equations are not currently applicable in the economic model chosen for this study, the well-established risk equations from the UKPDS were used. Additionally, only one study was used to extrapolate outcomes over a time horizon of 40 years, and the study was restricted to patients receiving metformin monotherapy. In clinical practice, many patients will have received additional drugs prior to semaglutide or dulaglutide . While the results are unlikely to be substantially different for patients receiving prior oral antihyperglycemic therapy, further modeling would be required to explore this question. Finally, because the most common cause of death in adults with T2D is CV disease , there is a need for further modeling that incorporates data from CV outcomes trials (CVOTs) [8, 17, 55]. The CADTH has recently highlighted the need to identify a model that encompasses the CV benefits of T2D treatments . In UKPDS 80, there were benefits in some macrovascular complications observed after many years, confirming the importance of HbA1c in these effects . However, recent CVOTs have demonstrated CV benefits after only a few years, indicating that although HbA1c control is beneficial for macrovascular complications, CV complications in diabetes may be influenced by aspects beyond the traditional risk factors such as HbA1c . As such, current risk equations are likely to underestimate the CV benefits that are associated with the treatments studied in these CVOTs, and discussions are ongoing on how to incorporate findings from CVOTs into standard long-term modeling [55, 57]. A recent cost-effectiveness analysis of canagliflozin versus sitagliptin incorporated findings from the CANVAS CVOT trial . Although the data could not be included in this study, semaglutide has been investigated in SUSTAIN 6, a phase III CVOT that demonstrated a 26% reduction in the risk of major adverse CV events , and dulaglutide has been investigated in the REWIND CVOT , with preliminary results reporting significantly reduced major adverse CV events . Consequently, the CV benefits seen in these trials could not be accounted for, such that this study might underestimate the value of both semaglutide and dulaglutide in reducing macrovascular complications and their associated costs. The strengths of this study include the use of a validated and transparent economic model to assess both the base-case (simplified approach) and the more clinically relevant scenario analysis in the same study, as well as the extensive use of deterministic and probabilistic sensitivity analyses to evaluate the robustness of the results. This study is the first comparing the cost effectiveness of semaglutide versus dulaglutide in a Canadian setting, and builds on the current evidence that exists on the economic value of GLP-1RAs. Although relevance across borders is limited, other cost-effectiveness studies of semaglutide versus dulaglutide have validated the cost effectiveness of semaglutide [62, 63], and the reimbursement of semaglutide has been approved in Denmark , Ireland , and Switzerland . Our findings suggest that semaglutide may be a cost-effective treatment option, compared with dulaglutide, in patients inadequately controlled on metformin monotherapy, and, ultimately, may offer a preferred treatment for the Canadian healthcare system. All data used in the analyses are available in the article tables and electronic supplementary material. The health economic diabetes model described in this study is proprietary of the Swedish IHE, Lund, Sweden. Access to the model is at the discretion of the IHE. The authors thank Adam Fridhammar of the Swedish IHE for reviewing the simulations and assumptions made in the analyses and contributing with feedback and technical support regarding the model. The authors also thank Stacy Carl-McGrath (AXON Communications) and Jeshika Singh (PHMR) for medical writing and editorial assistance, funded by Novo Nordisk A/S. PJ, JHB, SP, AL and PB provided the study concept and design, and contributed to the analysis and interpretation of data. LAL contributed to the analysis and interpretation of data. All authors contributed to the drafting of the paper, critically revised the paper for intellectual content, were involved in the final approval of the version to be published, and agreed to be accountable for all aspects of the work. This study was supported and open access publication was sponsored by Novo Nordisk A/S. Pierre Johansen, Aiden R. Liu and Peter Bech are employees of Novo Nordisk. Pierre Johansen was employed by the Swedish IHE prior to the time of this study. Jonas Håkan-Bloch was employed by Novo Nordisk at the time this study was conducted. Sofie Persson is employed by IHE, which received grant funding from Novo Nordisk. Lawrence A. Leiter received no payment or services related to this study, but has received research support from AstraZeneca, Boehringer Ingelheim, Eli Lilly, GSK, Janssen, Merck, Novo Nordisk and Sanofi, and has been on advisory panels and provided continuing medical education for AstraZeneca, Boehringer Ingelheim, Eli Lilly, Janssen, Merck, Novo Nordisk, Sanofi and Servier. International Diabetes Federation. Canada Country Report 2017 & 2045. IDF Diabetes Atlas, 8th ed. Brussels: International Diabetes Federation; 2017. https://reports.instantatlas.com/report/view/704ee0e6475b4af885051bcec15f0e2c/CAN. Accessed Oct 2018.
International Diabetes Federation. IDF Diabetes Atlas, 7th ed. Brussels. International Diabetes Federation; 2017. http://www.diabetesatlas.org. Accessed June 2018. Somerville R. An economic tsunami: the cost of diabetes in Canada. Toronto: Canadian Diabetes Association; 2009. https://www.diabetes.ca/CDA/media/documents/publications-and-newsletters/advocacy-reports/economic-tsunami-cost-of-diabetes-in-canada-english.pdf. Accessed Oct 2018. Canadian Agency for Drugs and Technologies in Health (CADTH). Therapeutic review of third-line drugs for type 2 diabetes—an update. 2018. https://www.cadth.ca/news/therapeutic-review-third-line-drugs-type-2-diabetes-update. Accessed Oct 2018. Novo Nordisk Canada Inc. Ozempic® approved in Canada for the treatment of adults with type 2 diabetes. 2018. https://www.newswire.ca/news-releases/ozempic-approved-in-canada-for-the-treatment-of-adults-with-type-2-diabetes-668432133.html. Accessed 5 Mar 2018. Canadian Agency for Drugs and Technologies in Health (CADTH). Dulaglutide. 2015. https://www.cadth.ca/dulaglutide. Accessed Sept 2018. The Dental and Pharmaceutical Benefits Agency (TLV). Lyxumia is included in the reimbursement system with limitation (Lyxumia ingår i högkostnadsskyddet med begränsning). 2015. https://www.tlv.se/beslut/beslut-lakemedel/begransad-subvention/arkiv/2015-02-26-lyxumia-ingar-i-hogkostnadsskyddet-med-begransning.html. Accessed Jan 2018. The Dental and Pharmaceutical Benefits Agency (TLV). Xultophy is included in the reimbursement system with limitation (Xultophy ingår i högkostnadsskyddet med begränsning). 2015. https://www.tlv.se/beslut/beslut-lakemedel/begransad-subvention/arkiv/2015-06-15-xultophy-ingar-i-hogkostnadsskyddet-med-begransning.html. Accessed Oct 2018. Socialstyrelsen. National guidelines for diabetes care—support for governance and management. 2015. http://www.socialstyrelsen.se/publikationer2015/2015-4-12. Accessed Oct 2018. Canadian Agency for Drugs and Technologies in Health (CADTH). Therapeutic review. New drugs for type 2 diabetes: second-line therapy—science report. 2018. https://www.cadth.ca/sites/default/files/pdf/TR0012_T2D_Science_Report.pdf. Accessed Jun 2018. Heap G. Type 2 diabetes current treatment detailed, expanded analysis: physician insights (EU5). Decision Resources Group. 2017. https://decisionresourcesgroup.com/report/716654-biopharma-type-2-diabetes-current-treatment-detailed/. Accessed Jan 2019. National Institute for Health and Care Excellence. Multiple technology appraisal: canagliflozin, dapagliflozin and empagliflozin as monotherapies for treating type 2 diabetes. 2016. https://www.nice.org.uk/guidance/ta390/documents/committee-papers. Accessed Oct 2018. National Institute for Health and Care Excellence. Type 2 diabetes in adults: management [NG28]. Appendix F: full health economics report. 2015. https://www.nice.org.uk/guidance/ng28/evidence/appendix-f-full-health-economics-report-pdf-2185320355. Accessed Jan 2019. ClinicalTrials.gov. Researching cardiovascular events with a weekly incretin in diabetes (REWIND). 2017. https://clinicaltrials.gov/ct2/show/NCT01394952. Accessed July 2017. Eli Lilly. Trulicity® (dulaglutide) demonstrates superiority in reduction of cardiovascular events for broad range of people with type 2 diabetes. 2018. https://www.prnewswire.com/news-releases/trulicity-dulaglutide-demonstrates-superiority-in-reduction-of-cardiovascular-events-for-broad-range-of-people-with-type-2-diabetes-300743485.html. Accessed Nov 2018. Laegemiddelstyrelsen (Danish Medicines Agency). Ozempic® får generelt klausuleret tilskud. 2018. https://laegemiddelstyrelsen.dk/da/nyheder/2018/ozempic-faar-generelt-klausuleret-tilskud/. Accessed Aug 2018. Health Service Executive Ireland. Ozempic. Health Service Executive Ireland. 2018. https://www.sspcrs.ie/druglist/search/category/1?description=ozempic. Accessed Oct 2018. Bundesamt für Gesundheit BAG. BAG-Bulletin: Informationsmagazin für medizinische Fachpersonen und Medienschaffende. Bundesamt für Gesundheit BAG. 2018. https://www.bag.admin.ch/dam/bag/de/dokumente/cc/Kampagnen/Bulletin/2018/BU_38_18.pdf.download.pdf/BU_38_18_DE.pdf. Accessed Oct 2018. Canadian Agency for Drugs and Technologies in Health (CADTH). Guidelines for the economic evaluation of health technologies: Canada. 2017. https://cadth.ca/sites/default/files/pdf/guidelines_for_the_economic_evaluation_of_health_technologies_canada_4th_ed.pdf. Accessed Aug 2018. Canadian Agency for Drugs and Technologies in Health (CADTH). Optimal use recommendations for second- and third-line therapy for patients with type 2 diabetes. CADTH optimal use report. Ottawa, CADTH; 2013. https://www.cadth.ca/sites/default/files/pdf/OP0512_Diabetes_RecsReport_2nd_3rd-line_e.pdf. Accessed June 2018. Working Days. Working days in Canada. 2017. http://www.workingdays.ca/workingdays_holidays_2017.htm. Accessed Aug 2018.